The brain is the engine of reason and the seat of the soul. It is the substrate in which our minds reside. The problem is that this substrate is prone to decay. Eventually, our brains will cease to function and along with them so too will our minds. This will result in our deaths. Little wonder then that the prospect of transferring (or uploading) our minds to a more robust, technologically advanced, substrate has proved so attractive to futurists and transhumanists. But is it really feasible? This is a question I’ve looked at many times before, but the recent book Intelligence Unbound: The Future of Uploaded and Machine Minds offers perhaps the most detailed, sophisticated and thoughtful treatment of the topic. It is a collection of essays, from a diverse array of authors, probing the key issues from several different perspectives. I highly recommend it. Within its pages you will find a pair of essays debating the philosophical aspects of mind-uploading (you’ll find others too, but I want to zone-in on this pair because one is a direct response to the other). The first of those essays comes from David Chalmers and is broadly optimistic about the prospect of mind-uploading. The second of them comes from Massimo Pigliucci and is much less enthusiastic. 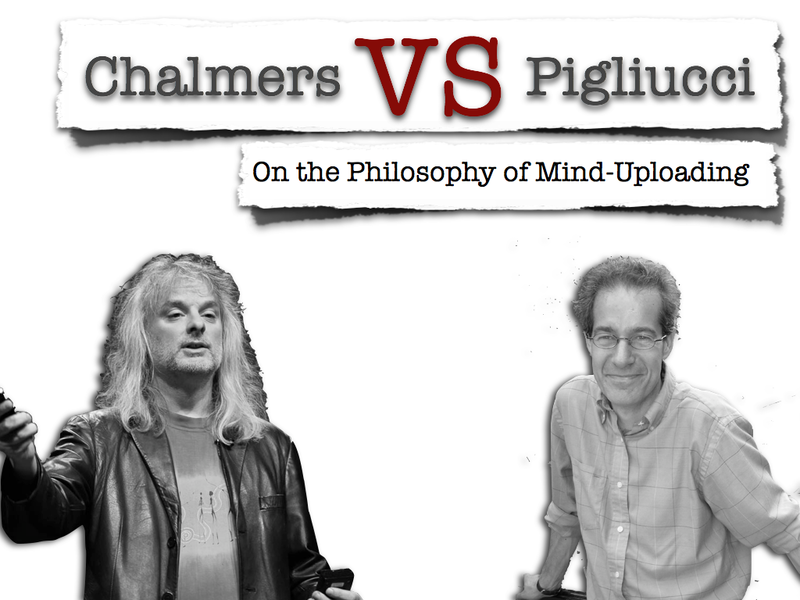 In this two-part series of posts, I want to examine the debate between Chalmers and Pigliucci. I start by looking at Chalmers’s contribution. Destructive Uploading: As the name suggests, this is a method of mind-uploading that involves the destruction of the original (biological) mind. An example would be uploading via serial sectioning. The brain is frozen and its structure is analyzed layer by layer. From this analysis, one builds up a detailed map of the connections between neurons (and other glial cells if necessary). This information is then used to build a functional computational model of the brain. Gradual Uploading: This is a method of mind-uploading in which the original copy is gradually replaced by functionally equivalent components. One example of this would be nanotransfer. Nanotechnology devices could be inserted into the brain and attached to individual neurons (and other relevant cells if necessary). They could then learn how those cells work and use this information to simulate the behaviour of the neuron. This would lead to the construction of a functional analogue of the original neuron. Once the construction is complete, the original neuron can be destroyed and the functional analogue can take its place. This process can be repeated for every neuron, until a complete copy of the original brain is constructed. Nondestructive Uploading: This is a method of mind-uploading in which the original copy is retained. Some form of nanotechnology brain-scanning would be needed for this. This would build up a dynamical map of current brain function — without disrupting or destroying it — and use that dynamical map to construct a functional analogue. Whether these forms of uploading are actually technologically feasible is anyone’s guess. They are certainly not completely implausible. I can certainly imagine a model of the brain being built from a highly detailed scan and analysis. It might take a huge amount of computational power and technical resources, but it seems within the realm of technological possibility. The deeper question is whether our minds would really survive the process. This is where the philosophical debate kicks-in. The Consciousness Issue: Would the uploaded mind be conscious? Would it experience the world in a roughly similar manner to how we now experience the world? The Identity/Survival Issue: Assuming it is conscious, would it be our consciousness (our identity) that survives the uploading process? Would our identities be preserved? The two issues are connected. Consciousness is valuable to us. Indeed, it is arguably the most valuable thing of all: it is what allows us to enjoy our interactions with the world, and it is what confers moral status upon us. If consciousness was not preserved by the mind-uploading process, it is difficult to see why we would care. So consciousness is a necessary condition for a valuable form of mind-uploading. That does not, however, make it a sufficient condition. After all, two beings can be conscious without sharing any important connection (you are conscious, and I am conscious, but your consciousness is not valuable to me in the same way that it is valuable to you). What we really want to preserve through uploading is our individual consciousnesses. That is to say: the stream of conscious experiences that constitutes our identity. But would this be preserved? These two issues form the heart of the Chalmers-Pigliucci debate. 2. Would consciousness survive the uploading process? So let’s start by looking at Chalmers’s take on the consciousness issue. Chalmers is famously one of the new-Mysterians, a group of philosophers who doubt our ability to have a fully scientific theory of consciousness. Indeed, he coined the term “The Hard Problem” of consciousness to describe the difficulty we have in accounting for the first-personal quality of conscious experience. Given his scepticism, one might have thought he’d have his doubts about the possibility of creating a conscious upload. But he actually thinks we have reason to be optimistic. He notes that there are two leading contemporary views about the nature of consciousness (setting non-naturalist theories to the side). The first — which he calls the biological view — holds that consciousness is only instantiated in a particular kind of biological system: no nonbiological system is likely to be conscious. The second — which he (and everyone else) calls the functionalist view — holds that consciousness is instantiated in any system with the right causal structure and causal roles. The important thing is that the functionalist view allows for consciousness to be substrate independent, whereas the biological view does not. Substrate independence is necessary if an upload is going to be conscious. So which of these views is correct? Chalmers favours the functionalist view and he has a somewhat elaborate argument for this. The argument starts with a thought experiment. The thought experiment comes in two stages. The first stage asks us to imagine a “perfect upload of a brain inside a computer” (p. 105), by which is meant a model of the brain in which every relevant component of a biological brain has a functional analogue within the computer. This computer-brain is also hooked up to the external world through the same kinds of sensory input-output channels. The result is a computer model that is a functional isomorph of a real brain. Would we doubt that such a system was conscious if the real brain was conscious? Here we upload different components of the brain one by one, over time. This might involve gradual replacement of entire brain areas with computational circuits, or it might involve uploading neurons one at a time. The components might be replaced with silicon circuits in their original location…It might take place over months or years or over hours. If a gradual uploading process is executed correctly, each new component will perfectly emulate the component it replaces, and will interact with both biological and nonbiological components around it in just the same way that the previous component did. So the system will behave in exactly the same way that it would have without the uploading. Critical to this exercise in imagination is the fact that the process results in a functional isomorph and that you can make the process exceptionally gradual, both in terms of the time taken and the size of the units being replaced. With the building blocks in place, we now ask ourselves the critical question: if we were undergoing this process of gradual replacement, what would happen to our conscious experience? There are three possibilities. Either it would suddenly stop, or it would gradually fade out, or it would be retained. The first two possibilities are consistent with the biological view of consciousness; the last is not. It is only consistent with the functional view. 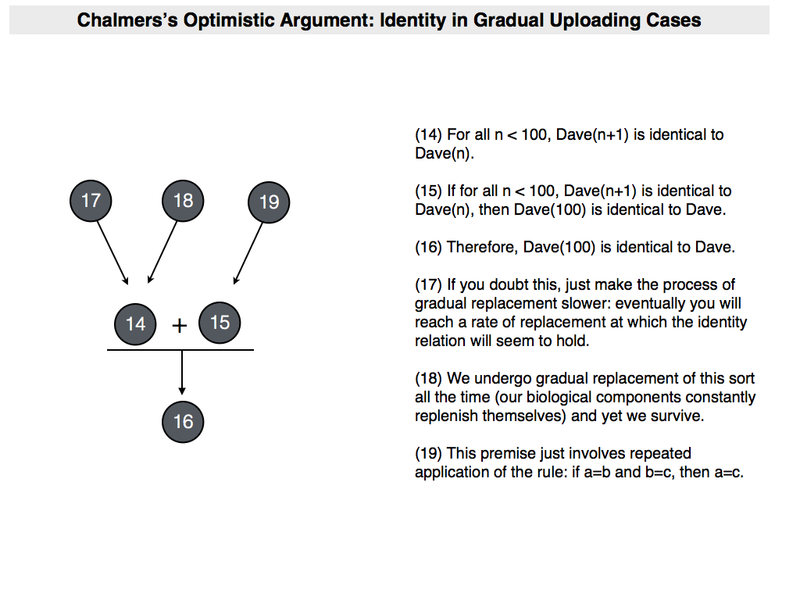 Chalmers’s argument is that the last possibility is the most plausible. (1) If the parts of our brain are gradually replaced by functional isomorphic component parts, our conscious experience will either: (a) be suddenly lost; (b) gradually fadeout; or © be retained throughout. (2) Sudden loss and gradual fadeout are not plausible; retention is. (3) Therefore, our conscious experience is likely to be retained throughout the process of gradual replacement. (4) Retention of conscious experience is only compatible with the functionalist view. (5) Therefore, the functionalist view is like to be correct; and preservation of consciousness via mind-uploading is plausible. Chalmers adds some detail to the conclusion, which we’ll talk about in a minute. The crucial thing for now is to focus on the key premise, number (2). What reason do we have for thinking that retention is the only plausible option? With regard to sudden loss, Chalmers makes a simple argument. If we were to suppose, say, that the replacement of the 50,000th neuron led to the sudden loss of consciousness, we could break down the transition point into ever more gradual steps. So instead of replacing the 50,000th neuron in one go, we could divide the neuron itself into ten sub-components and replace them gradually and individually. Are we to suppose that consciousness would suddenly be lost in this process? If so, then break down those sub-components into other sub-components and start replacing them gradually. The point is that eventually we will reach some limit (e.g. when we are replacing the neuron molecule by molecule) where it is implausible to suppose that there will be a sudden loss of consciousness (unless you believe that one molecule makes a difference to consciousness: a belief that is refuted by reality since we lose brain cells all the time without thereby losing consciousness). This casts the whole notion of sudden loss into doubt. With regard to gradual fadeout, the argument is more subtle. 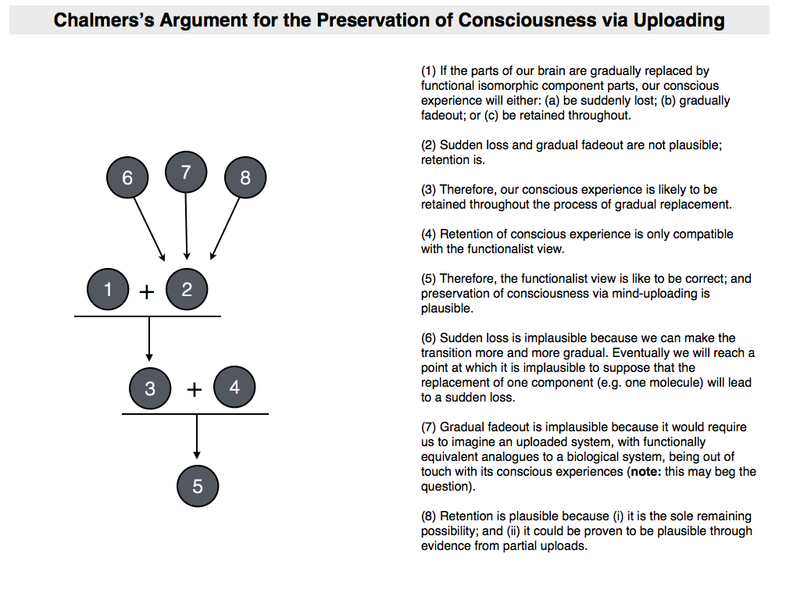 Remember it is critical to Chalmers’ thought experiment that the upload is functionally isomorphic to the original brain: for every brain state that used to be associated with conscious experience there will be a functionally equivalent state in the uploaded version. If we accept gradual fadeout, we would have to suppose that despite this equivalence, there is a gradual loss of certain conscious experiences (e.g. the ability to experience black and white, or certain high-pitched sounds etc.) despite the presence of functionally equivalent states. Chalmers’ argues that this is implausible because it asks us to imagine a system that is deeply out of touch with its own conscious experiences. I find this slightly unsatisfactory insofar as it may presuppose the functionalist view that Chalmers is trying to defend. But, in any event, Chalmers suggests that the process of partial uploading will convince people that retention of consciousness is likely. Once we have friends and family who have had parts of their brains replaced, and who seem to retain conscious experience (or, at least, all outward signs of having conscious experience), we are likely to accept that consciousness is preserved. After all, I don’t doubt that people with cochlear or retinal implants have some sort of aural or visual experiences. Why should I doubt it if other parts of the brain are replaced by functional equivalents? Chalmers concludes with the suggestion that all of this points to the likelihood of consciousness being an organizational invariant. What he means by this is that systems with the exact same patterns of causal organization are likely to have the same states of consciousness, no matter what those systems are made of. I’ll hold off on the major criticisms until part two, since this is the part of the argument about which Pigliucci has the most to say. Nevertheless, I will make one comment. I’m inclined towards functionalism myself, but it seems to me that in crafting the thought experiment that supports his argument, Chalmers helps himself to a pretty colossal assumption. He assumes that we know (or can imagine) what it takes to create a “perfect” functional analogue of a conscious system like the brain. But, of course, we don’t know really know what it takes. Any functional model is likely to simplify and abstract from the messy biological details. The problem is knowing which of those details is critical for ensuring functional equivalence. We can create functional models of the heart because all the critical elements of the heart are determinable from a third person perspective (i.e. we know what is necessary to make the blood pump from a third person perspective). That doesn’t seem to be the case with consciousness. In fact, that’s what Chalmers’s Hard Problem is supposed to highlight. 3. Will our identities be preserved? Will we survive the process? Let’s assume Chalmers is right to be optimistic about consciousness. Does that mean he is right to be optimistic about identity/survival? Will the uploaded mind be the same as we are? Will it share our identity? Chalmers has more doubts about this, but again he sees some reason to be optimistic. He starts by noting that there are three different philosophical approaches to personal identity. The first is biologism (or animalism), which holds that preservation of one’s identity depends on the preservation of the biological organism that one is. The second is psychological continuity, which holds that preservation of one’s identity depends on maintaining threads of overlapping psychological states (memories, beliefs, desires etc.). The third, slightly more unusual, is Robert Nozick’s “closest continuer” theory, which holds that preservation of identity depends on the existence of a closely-related subsequent entity (where “closeness” is defined in various ways). Chalmers then defends two different arguments. The first gives some reason to be pessimistic about survival, at least in the case of destructive and nondestructive forms of uploading. The second gives some reason to be optimistic, at least in the case of gradual uploading. The end result is a qualified optimism about gradual uploading. Let’s start with the pessimistic argument. Again, it involves a thought experiment. Imagine a man named Dave. Suppose that one day Dave undergoes a nondestructive uploading process. A copy of his brain is made and uploaded to a computer, but the biological brain continues to exist. There are, thus, two Daves: BioDave and DigiDave. It seems natural to suppose that BioDave is the original, and his identity is preserved in this original biological form; and it is equally natural to suppose that DigiDave is simply a branchline copy. In other words, it seems natural to suppose that BioDave and DigiDave have separate identities. (9) In nondestructive uploading, DigiDave is not identical to Dave. (10) If in nondestructive uploading, DigiDave is not identical to Dave, then in destructive uploading, DigiDave is not identical to Dave. 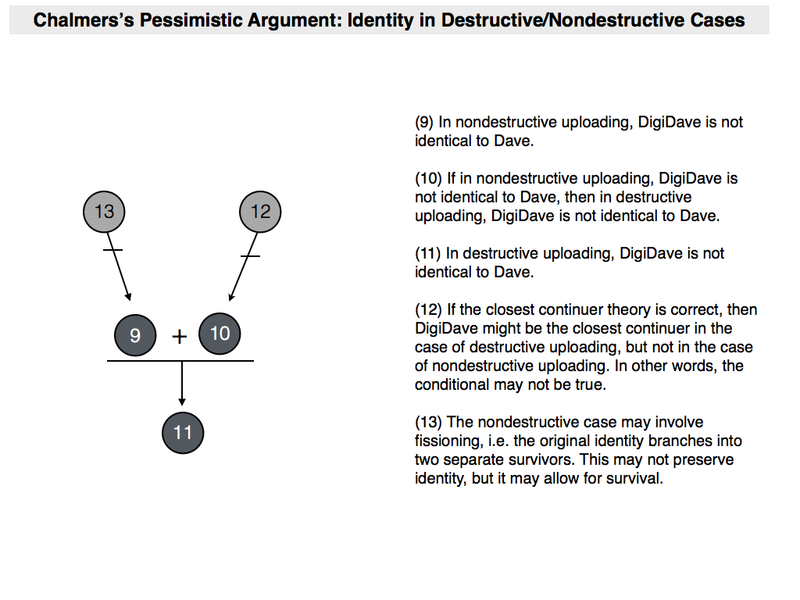 (11) In destructive uploading, DigiDave is not identical to Dave. This looks pretty sound to me. And as we shall see in part two, Pigliucci takes a similar view. Nevertheless, there are two possible ways to escape the conclusion. The first would be to deny premise (2) by adopting the closest continuer theory of personal identity. The idea then would be that in destructive (but not non-destructive) uploading DigiDave is the closest continuer and hence the vessel in which identity is preserved. I think this simply reveals how odd the closest continuer theory really is. The other option would be to argue that this is a fission case. It is a scenario in which one original identity fissions into two subsequent identities. The concept of fissioning identities was originally discussed by Derek Parfit in the case of severing and transplanting of brain hemispheres. In the brain hemisphere case, some part of the original person lives on in two separate forms. Neither is strictly identical to the original, but they do stand in “relation R” to the original, and that relation might be what is critical to survival. It is more difficult to say that nondestructive uploading involves fissioning. But it might be the best bet for the optimist. The argument then would be that the original Dave survives in two separate forms (BioDave and DigiDave), each of which stands in relation R to him. But I’d have to say this is quite a stretch, given that BioDave isn’t really some new entity. He’s simply the original Dave with a new name. The new name is unlikely to make an ontological difference. Let’s now turn our attention to the optimistic argument. This one requires us to imagine a gradual uploading process. Fortunately, we’ve done this already so you know the drill: imagine that the subcomponents of the brain are replaced gradually (say 1% at a time), over a period of several years. It seems highly likely that each step in the replacement process preserves identity with the previous step, which in turn suggests that identity is preserved once the process is complete. (14) For all n < 100, Daven+1 is identical to Daven. (15) If for all n < 100, Daven+1 is identical to Daven, then Dave100 is identical to Dave. (16) Therefore, Dave100 is identical to Dave. If you’re not convinced by this 1%-at-a-time version of the argument, you can adjust it until it becomes more persuasive. In other words, setting aside certain extreme physical and temporal limits, you can make the process of gradual replacement as slow as you like. Surely there is some point at which the degree of change between the steps becomes so minimal that identity is clearly being preserved? If not, then how do you explain the fact that our identities are being preserved as our body cells replace themselves over time? Maybe you explain it by appealing to the biological nature of the replacement. But if we have functionally equivalent technological analogues it’s difficult to see where the problem is. Chalmers adds other versions of this argument. These involve speeding up the process of replacement. His intuition is that if identity is preserved over the course of a really gradual replacement, then it may well be preserved over a much shorter period of replacement too, for example one that takes a few hours or a few minutes. That said, there may be important differences when the process is sped up. It may be that too much change takes place too quickly and the new components fail to smoothly integrate with the old ones. The result is a break in the strands of continuity that are necessary for identity-preservation. I have to say I would certainly be less enthusiastic about a fast replacement. I would like the time to see whether my identity is being preserved following each replacement. That brings us to the end of Chalmers’ contribution to the debate. He says more in his essay, particularly about cryopreservation, and the possible legal and social implications of uploading. But there is no sense in addressing those topics here. Chalmers doesn’t develop his thoughts at any great length and Pigliucci wisely ignores them in his reply. We’ll be discussing Pigliucci’s reply in part two. Do Cognitive Enhancing Drugs Actually Work?